L: Case: 4.75". Top Pouch: 2.0". Bottom Pouch: 2.75". Zippered Compartments: 3.5". Handle: 5.0". W: Case: 5.0". Top Pouch: 4.0". Bottom Pouch: 4.0". Zippered Compartments: 3.5". Handle: .75"
Care Instructions: Outside: Gently wipe with a lightly damp cloth, then dry with a dry cloth. Inside: Spot clean and air dry. Engraving Options: May be personalized with a single initial or monogram at no additional cost. 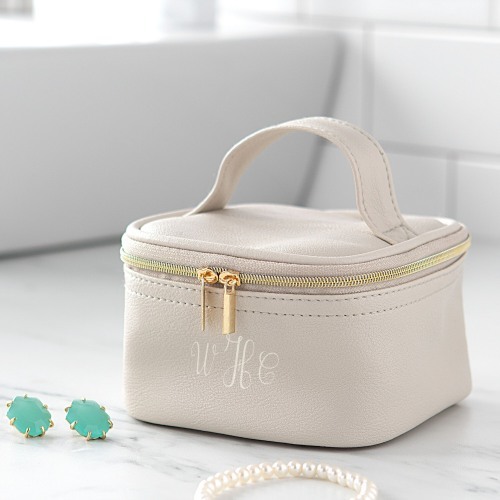 The Personalized Travel Jewelry Case is perfect for your travel needs. This Vegan Leather Jewelry Organizer features several compartments and zipper closure to keep your jewelry safe and secure.